Traditional Gregorian chant melodies — radically re-arranged for a world fusion jazz quintet. Saint John Baptist De La Salle was a 17th-century French educational reformer. He founded the Institute of the Brothers of the Christian Schools, a Roman Catholic religious order which provides a human and Christian education to the young, especially the economically marginalized. His wisdom and influence continues to reverberate today in the many teachers and schools that are inspired by his work. Those who identify or are associated with his mission and legacy are called Lasallians. In 2017, the Institute’s leaders released a spiritual reflection entitled Lasallians Without Limits. They wrote that “beyond borders, we discover the will of [God],” encouraging Lasallians to disrupt the divisions that restrict human potential, quell creativity, and inhibit spiritual growth. Chant Triptych II is my artistic response to this reflection. I attempted to foster intercultural musical cooperation — to build bridges at a time when racist rhetoric urges us to close borders and build walls. This is my second of three albums bridging my work as a high school administrator and professional musician, and applying Gregorian chant melodies to new musical contexts. In the first album, I adapted the chant melodies assigned to De La Salle’s feast day, creating ambient wordless music I call audio incense. With this second album, I’m reimagining the same melodies once again, rearranging their rhythms and adding harmonic content. These melodies were originally used for sung liturgical prayer music, but I wanted to take them elsewhere so the end result is quite different. There’s a long history of this kind of adaptation in many music genres. Jazz musicians in the 1940s and ‘50s borrowed the chord progressions and frameworks of existing tunes and wrote new melodies for them. The result was called a “contrafact.” This project is a kind of reverse contrafact: I took existing melodies and gave them new rhythms, chords, and frameworks. The original chant melodies were divided into groups of two or three notes, suggesting rhythmic possibilities which I incorporated into the new arrangements. I also added rhythmic figures like triplets to add contrast and variety. Whenever possible, I honoured the original musical phrasing suggested by the text. A wide variety of music beyond my usual borders helped to inspire this work. John McLaughlin’s Shakti marries North and South Indian music with jazz. Chris Speed’s Pachora brings together Eastern European music and jazz improvisation. John Zorn’s Masada applies Hebraic musical scales to Ornette Coleman’s improvisational concepts. Additionally, I was inspired by Dan Weiss’s adaptation of Indian classical tabla repertoire to solo drum set, oud player Rabih Abou Khalil’s cross-cultural explorations, Sintesis’s application of traditional Afro-Cuban Orisha chants to jazz-rock, and bassist Eberhard Weber’s orchestration of his previously recorded improvised solos. 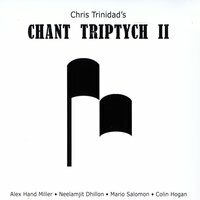 Inspired by these artists, I developed a list of compositional approaches which I applied to my new arrangements of these chant melodies. Another of the Institute’s spiritual reflections, One Call, Many Voices, inspired me to bring together musicians of various traditions who had never played together. I called on them to reach beyond their own borders, find common ground, and apply their “many voices” in an unfamiliar musical context. Alex Hand Miller (guitar, tambura) graduated from the University of Nevada in Reno with a degree in jazz studies. He studied traditional Balkan music in Bulgaria and has been committed to exploring the common ground between Western art music, jazz, and the folk music of Eastern Europe. I met Alex while playing with Danny Cao’s Du Uy Quintet. Colin Hogan (accordion, melodica) graduated from California State University East Bay with a degree in piano performance. He collaborates with a number of Bay Area musicians and groups, including brothers Steve and Julian in a family band called the Hogan Brothers. I was introduced to Colin while playing with Latin/reggae/timba band Manicato. Mario Salomon (percussion) was born in Camagüey, Cuba. He studied at Escuela de Superación Para el Arte in Cuba, where he specialized in percussion. He worked as a drummer and songwriter with Ashere, where he developed his own sound in Cuban music and Latin jazz. After moving to the United States, he collaborated with groups like La Nueva Generación de la Salsa in Miami and La Tematika in New York. Now based in the San Francisco Bay Area, he leads his own band called Mario y su Timbeko. Pianist and designer Peter Meredith connected me with Mario. Neelamjit Dhillon (tabla, bansuri, kanjira, alto saxophone) was born and raised in Vancouver, Canada. He is a multi-instrumentalist who lives in the intersection of North Indian classical music and North American jazz. Neelamjit’s music is a reflection of his own multifaceted identity and spirituality. His vision is promoting a “more equitable and just society through shared experience and collective action.” A fellow Canadian expatriate and Capilano College grad, Neelamjit has been a musical comrade since we studied jazz together in the late ‘90s. My appreciation goes to all who have contributed to this project: Alex Hand Miller, Colin Hogan, Mario Salomon, Neelamjit Dhillon, Jeremy Goody, Andro Ernst, Tarik Kazaleh, and Peter Meredith. Extra special thanks to my wife and life partner, Pia, whose listening ears and constant support remind me of how very blessed I am. This work is dedicated to my mom, Maria Asuncion Rivera Trinidad, and dad, Jaime Oñate Trinidad. They nurtured my love of music from a very early age. I also dedicate this work to my grandmother Felizarda Puatu Rivera, who, by her example, shows me how to live a life of perseverance, unconditional love, and joy.